The Nokia E70 is a powerful networking device incorporating the latest connectivity methods from advanced voice to data features. 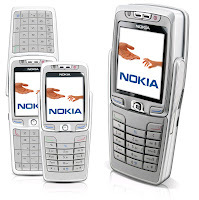 - The Nokia E70 incorporates GPRS/EGPRS and WCDMA networks for fast, wide area connectivity with WLAN for complementary local area connectivity. - Ability to store 2 gigabytes of data with miniSD (secure digital) memory cards.